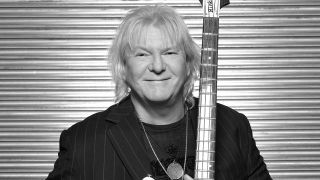 “I was influenced by many players from the 70s but Chris Squire was the number one geezer as far as I was concerned. He was where I saw my sound and where I wanted to go musically. I was aware of Fish Out Of Water when it first came out but I didn’t get a chance to hear it until sometime around 2005. I took it around on tour with me, listening to it almost like a piece of homework because I felt like it was one of those things that I had to get into. Hearing it initially, like most really good records, I knew it was going to take a bit of listening because it was quite dense. When I delved into it and got into the orchestration, to the production and the playing, I realised that it was such a rich construction. “Chris is a symphonic bass player. If you listen to what he plays, there are so many voicings, so many different styles and sounds and production ideas going on. Apart from Chris’ full palette of bass sounds, Andrew Pryce Jackman’s arrangements and orchestrations make it so sweet and so beautiful. “From a writing point of view, it fits into the progressive genre. There’s a lot of extemporisation, long-form ideas in keeping with the progressive idiom. With my ‘pop music’ head on, an album should be 10 songs, but that was never the way with progressive musicians. They always extemporised everything and that’s what this record has. It takes a few really great ideas and really extrapolates them to something else, which again is why I loved Yes so much. “All the tracks from Fish Out Of Water have something amazing about them but if I had to pick one moment, I think I’d go for the beginning of Silently Falling, with Jimmy Hastings’ flute. It’s almost like drinking a fine Scotch whisky and then adding a little spring water to it: the bouquet completely opens up. You feel that you’ve got inside the head of the artist. It’s one of my favourite records. Absolutely amazing. “I was very fortunate to get to know Chris and hung out with him a lot. We’d hook up whenever the opportunity arose. I tried to go and see him when he was in the hospital in Phoenix and called his wife, Scottie, a couple of weeks before he died, offering to bring him some grapes and plump up his pillows for him, which I think made him laugh. This tribute originally appeared in issue 86 of Prog Magazine, on sale now. You can read their full Yes and Chris Squire cover story by picking up an issue here.